I woke up well rested in the Britannia Guesthouse in South Shields and sorted my (now dried) gear and packed my bags before heading to the breakfast room. My guess at being the only guest in the house appeared to be confirmed as I had the place to myself (apart from the lovely lady serving me). A good full fry up set me up for the long day ahead and before too long the bike was loaded back up for the day and I was heading off. A brief starter ride took me back to Arbeia Roman Fort which marked the start of the Hadrian’s Cycleway. The Hadrian’s Cycleway is normally ridden in the opposite direction and actually starts quite a way down the Cumbrian Coast at Ravenglass from where it follows the coast north eventually meeting the the western end of the wall at Bowness on Solway before roughly following its route (though very little of the official cycle way follows the wall exactly) across county to where I was now standing. My plan for this trip was to follow the route along the length of the wall from east to west but then only stay with it as far along the coast as Workington from where I would head back east on the Sea 2 Sea (C2C) route to Sunderland. Today was due to be the longest of my four days riding with roughly 85 miles planned to take me into Carlisle. As such I was pleased to be up and on my way early as this was going to be a long days riding. As it transpired things didn’t exactly go to plan as events would go awry a while east of Carlisle; but as I set off I wasn’t to know this! The South Shields section is actually a bit of an added extra to the route which many people don’t bother with; choosing to finish instead on the north bank of the Tyne at the ruins of Tynemouth Priory. The reason being that from Arbeia fort it is only a very short ride to the South Shields Ferry which then takes you to the north bank of the river. This is a nice added extra though. I caught a sparsely populated 8:45 ferry which gave a lovely view up and down the Tyne before we docked at North Shields. The first few miles were uneventful beyond having to nurse my GPS equipment which had chosen today to start playing up (it seemingly just didn’t like this part of town as by the time I hit Newcastle proper it was happily up and running). The ride into the city centre was good and easy going. 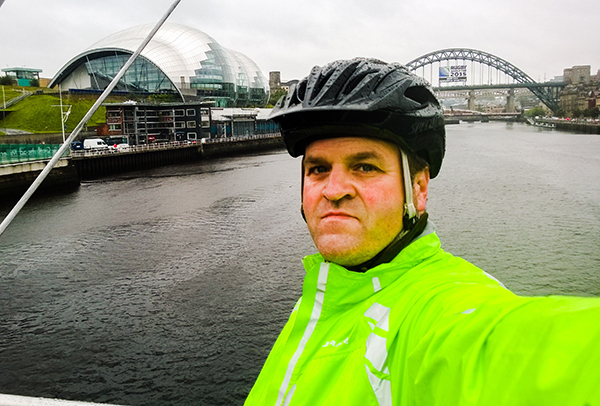 Kudos to the council – the route was very well signposted and laid out – some of the best urban riding I have done. The route did travel slightly more inland away from the river (and slightly higher above its banks) than I had anticipated but that allowed for some excellent views when there was the occasional gap in the housing/industry. Another ‘official’ start point was marked when I passed by Segendum Roman Fort at the aptly named Wallsend. Segendum is now a proper visitor attraction which I didn’t go into (I don’t think it was open at that time of the morning) but the route passes along its southern edge and the last remaining stretch of wall comes right down onto the cycle path; what would have been its final few yards down the river have since been obliterated by the (now derelict) Swan Hunter ship yard lying between the cycle path and the river. From here the ride followed an old railway line for a distance before diverting off and diving back down to the riverside and into Newcastle City Centre. The Millennium and Tyne bridges were looking much more welcoming in the bright sunshine today and my sprits were well and truly raised. I would now be following the Tyne west for the next few hours. Having passed under the iconic Tyne Bridge the route varied between some lovely riverside paths and occasional forays slightly inland; normally on old railway tracks. The city slowly faded away and by the time I had reached Newburn the day was in full majesty. I stopped in a lovely riverside park; removed an unnecessary extra layer of clothing; applied some sun cream and had a quick bite to eat and a short rest. Back on the bike the route soon turned slightly away from the river in order to join the line of the old ‘Wylam Waggonway’. The waggonway played a vital role in the development of steam locomotion. Wylam was the birthplace of George Stephenson as were other steam pioneers Hackworth and Hedley; the latter of whom, in 1813, built the ‘Puffing Billy’ steam locomotive that carried coal from Wylam colliery into Newcastle. Nowadays the waggonway serves as a lovely cycle way and path up the Tyne valley (passing directly past Stephenson’s birthplace); occasionally crossing the river including at the magnificent shell of the Haggs Bank bridge before eventually petering out in the village of Ovingham. From Ovingham the route leaves the sanctuary of the dedicated cycle paths and instead onto small country lanes. The roads were all very quiet and there were certainly more cyclists on them than cars. However they also marked the end of the largely flat river side routes and the start of some more undulating countryside. I was still going well and enjoying the day as I rode into Corbridge; a lovely little rural market town nestling on the north bank of the Tyne and just south of the line of the wall. I had my first proper break here; taking on some food and plenty of water. I was happy with progress. I knew that I had my first big climb not too far ahead of me but was confident enough. I was nicely warmed up but not too tired. This climb should be fairly easy compared to some of those I knew were ahead of me in the next three days. Leaving Corbridge the route continues following country lanes with the occasional section along the riverside paths until arriving into Hexham. I had my first slight route deviation here; I must have missed a sign and ended up cycling over a golf course. I don’t think that would have been a popular route alteration but I managed to avoid being spotted and soon found myself back where I should have been following the railway line next to the river. Cutting back onto some country lanes (and by taking a sneaky short cut along a slightly busier B road) I soon found myself in the excellently named ‘Fourstones’. A quick drinks break and map check later I was ready for what was coming; the climb out of Newborough and up onto the hills proper. The climb, of roughtly 500-600 feet ascent was long but largely steady and it went well and as planned. I made it up without a break and before too long the hills opened out onto glorious open countryside. 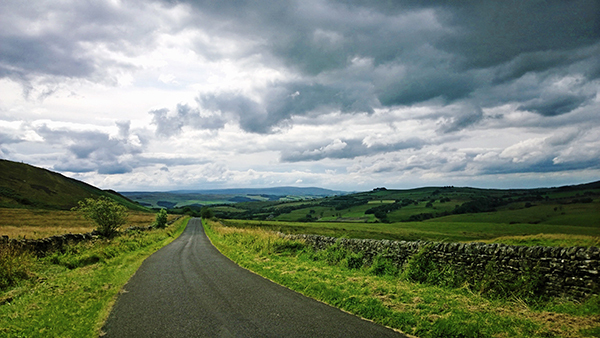 The day was going great and I happily rode along singing loudly to any passing wildlife and generally enjoying everything that Northumberland had to offer me here. At this stage the route is on one of its sections closer to the wall but actually rides parallel to it on the next hill across. Along this section it would be possible to follow the wall much more closely but the road alongside it is much busier and I guess that is why the smaller lanes are chosen instead. It’s a bit of shame that you don’t get closer to the wall; but the riding is certainly more pleasant for it. What’s more the wall is visible along this section and I could soon make out the distinctive remains of Housesteads Roman Fort on the hill opposite. Not long after Housesteads the route started to drop back down off the hills and there were soon a couple of very steep descents as it drops down to Vindolanda fort. One of the main attractions directly on the wall I had taken the decision to stop here. 85 miles riding wasn’t going to leave me with too much time to stop on route but at the same time I didn’t want to be just heads down cycling and not getting to see anything. I parked up at the visitor centre, paid my way in (leaving my paniers with the friendly staff) and went for a good wander around the site. Ignoring some of the romanticised displays near the tea shop, the site was indeed well worth the visit. The scale of the excavations is impressive and the location equally so. After a good walk around i retired back to the tea shop and sat sheltering from the still bright sun under a parasol having tea and cake. First a big line of clouds started to roll over and the parasol was no longer needed. Taking the hint I gathered my paniers, and got myself ready to get back on the road. As I pulled out and worked up through the gears I noticed that the chain was slipping in the higher cogs. There had been no such problems up until that point so this was unexpected and unwanted. I had a few fairly easy, mostly downhill miles into Haltwhistle so took the decision to ride easily into the town there and take a look where I could find somewhere safer to stop. The first rain drops started just on the very edge of Haltwhistle. By the time I rolled into the high street it was raining properly. I pulled into a bus shelter and took a look at the chain. I soon found the troublesome link that had stiffened up. I didnt have the tools to fix it but a quick check on my phone pointed me to a nearby bike shop. A quick ride across town proved it to be long gone. At this point I had around twenty miles remaining into Carlisle so the best bet was to continue on at an easy pace avoiding the higher gears where the slipping was most noticeable. Before setting off again I sent a quick message to my friend Jules. An old University friend who I had not seen for many years, she lives now in Brampton, way between Haltwhistle and Carlisle. I had arranged to pop in for a cuppa and a catch up so I let her know that i had been delayed but was now a little under an hour away. I headed out of Haltwhistle avoiding the top three gears on my casette. This wasn’t a problem to start with as the route took a steady climb back up onto the hills. Although this was along a smaller road out of the town there was still quite a number of trucks passing a little close for comfort. Combined with the wind and rain in my face this wasn’t the most fun. At the top of the hill the cycle way joined the Roman military road for a short stretch. This was the first time since Newcastle that I’d actually been on the route of the wall – not that you cold actually tell. Peering from under the brim of my helmet which was still angled down to keep the rain out of my face I saw a sign pointing to a quiet lane to the right and I gladly headed off along it. After a couple of minutes I thought that I should have been heading steeply downhill but instead every downhill was followed by a sharp climb as I rode along the crest of the hills. It was still raining but I was back on some glorious open countryside which, a scattering of sheep apart, I had entirely to myself. There were no route signs but I wasn’t concerned. This was a very quiet road with no turnings – there was no need for any road signs. After a little over three miles since leaving the military road I rounded a corner and saw a farm house a short way off. This was the first sign of habitation along this stretch. I got closer and eventually up to the farm house itself. Where the road completely stopped. This was not right. I had reached an end. And it wasn’t in the right place. Getting off the bike I reached back into the panniers and pulled out my maps. On previous rides I had learned the hard way that not stopping to check maps in the event of an uncertain junction can lead to trouble. Thanks to the rain I had ignored these lessons and now I was learning it all over again. I should never have turned right. The whole of this road was wrong. It was three miles of ups and downs that I should never have taken and there were no short cuts back. I sent a message to Jules to let her know my mishap but that I was back on track and now a little under an hour away. I decided to put my head down and clear the three miles back to the main road as quickly as possible. I’d done less than one of them when I had that tell tale feeling from my front tyre after riding over some gravel. A flat. Bloody typical. Never mind. I had all the kit with me. As the rain came more steadily down I took the front wheel off and started the replacement. As I was doing three ladies appeared on the road walking towards me. I recognised the look on their faces. They were lost as well. Did I know where the Roman Army Museum was? This one I could answer. It was on this track but right at the very start – just yards from the main road. I had managed to spot that earlier but they had missed it – probably also down to not looking around in the rain. I assured them that from harsh experience that there was nothing further down the track in the direction they were presently headed. Deflated they turned back and left me to my tyre. I got the new tube in and the wheel back on; gathered up my kit and loaded the bags back onto the rack. I sent a text to Jules. I had had a flat but was back underway and was now a little under an hour away…. All enthusiasm fading fast I got back on my way. I caught up with the ladies still heading back to the Museum and wished them luck. They were not too far away from it now but looking despondent. I carried on and not much further saw the entrance to the museum so I rode back and pointed them to the woods in which it sat and which they could see were not too far away at all. They did seem relieved and I felt better for having helped them a little at least. I made it back to the main road and looked to see where I had gone wrong. I found the sign I had followed. It did exist, it was labelled route 72 (the Hadrians Cycleway route number) and it did point the way I had travelled. However it did also say ‘Museum’ and next to it there was another sign pointing straight ahead which was the main route. Bugger. Still. I was back on the right track now. I was soon on a very steep descent down into Greenhead. Something didn’t feel right on the descent but I wasn’t sure what. At the bottom of the hill the route turned onto a bridleway and across a river and then I noticed a bulge in the front tyre. I immediately realised what was happening. In the wet I had been in such a haste to replace the tube that I hadn’t checked it was in correctly. Something had gone horribly wrong with the repair and I needed to sort it quickly. I jumped off the bike and whipped the paniers off ready to turn the bike over. As I did so the rail on one panier that holds it securely onto the rack snapped clean off. Great. I turned the bike over and was just about to take a look when BANG. And there my day essentially ended. In not fixing the tube properly I had forced it against the tyre which was under undue pressure and both it, and my replacement tube, exploded! There was a huge tear in the side of the tyre. I took one look and knew I was in tears or laughter territory. The young couple walking their dog who I had already spoted flinching when the tyre exploded quietly skirted around the loon who was at this point in hysterical laughter waving a bike wheel in the air in a vaguely Basil Fawlty fashion. There was no getting back from this. The day was done. All I could do was walk the bike back to Haltwhistle (without the six mile detour) and get a train to Carlisle. I rang Jules to cancel our meet up. Twenty minutes later, my bike was loaded into the back of my guardian angel Jules’ people carrier and we were headed to hers in Brampton. Not only had she come to pick me up even though I was wet through and caked in mud and oil but she insisted on feeding me before driving me on to Carlisle. This is what friends are. And once again I say huge, huge thanks to her and Frank for taking me in that day; letting me freshen up (of sorts) and making me feel human again. After a lovely evening Jules drove me into Carlisle and dropped me at my hotel. The day was done and I had failed to ride the final 15-20 miles of the day (though I had done 6 unplanned additional miles!). Not long after completing my first bike tour on the Avenue Verte last summer I was starting to contemplate my next challenge. Doing some more riding in Europe was my first thought with a few possible routes coming to mind. However after a bit more consideration it struck me that maybe I should find a good ride within the UK instead and give myself more of a challenge in terms of hills. My regular commuting rides are mostly along the flat coastline between Eastbourne and Hastings and as such I should try and gear myself up for some climbs instead. I picked up a set of the Sustrans guides to three of the main coast to coast rides (Hadrian’s Cycleway, Way of the Roses and Sea to Sea). I quickly decided that each route was a little shorter than I was hoping to achieve and after a fair bit of study decided on a combination of two routes. I would start by following the Hadrian’s route in reverse from South Shields. I would follow it to the end of the wall at Bowness on Solway and continue riding it as it headed down the west coast as far as Workington. Despite having no connection with the wall here the Hadrian Cycleway route actually continues South to Ravenglass. However from Workington I’d abandon that route and instead swap onto the Sea to Sea ride back across country to Sunderland (it might have given some symmetry to return to Tyne Mouth but I quite liked the idea of keeping the start and finish a bit more separate). This would have given me a total ride of about 250 miles (similar to the Avenue Verte) but I chose to give myself one less day (4 rather than 5) for the ride. One of these days I will try my hand at cycle camping but until I’m a bit more used to cycle touring in general I think I’ll stick with some home comforts. Also I had some longer days planned at the start of the ride and didn’t really want to add too much more weight on to the bike. With that in mind I fully planned my stops and booked in some B&Bs at South Shields (I will be travelling up the day before staying overnight and heading off first thing on day one), Carlisle, Portinscale (near Keswick) and Alston. Trains were also booked (with cycle space – an easy enough process with the East Coast route) and then it was a matter of getting myself in shape for the hills and then waiting for the off. As things got close I did some final trial rides; a 100+ mile ride across the Kent and Sussex Weald (lots of ups and downs) and a 25 mile ride deliberately planned to give me a few of the biggest climbs on the East Sussex part of the South Downs. These rides went well. I was as ready as I was going to be and after getting the bike a good clean and a service, so was she. The night before the ride I made sure that everything was packed and ready for an easy getaway. I’d primed the young lad next door to keep an eye on the house and water the tomatoes and I went to bed ready. The first day was actually mostly travelling with only a small ‘Prologue’ ride. So I had a leisurely breakfast, walked up to the allotment to give it a good soak, made the final adjustments to my bags, loaded them onto the bike and rode down the hill to Hastings station. PANIC!! After pushing my bike into the station building I walked to the ticket machine to collect my ticket for the first trains up to London (via Ashford). I had packed light and was not taking my wallet; just cash and the essential bank cards. I’d packed the wrong credit card; not the one I’d used when booking the tickets. I had 20 minutes until the train. If I missed it I’d miss all the connections. Quickly locking the bike up I jumped into a cab with my panniers and explained my predicament to the driver. He shot back up the hill at record speed and waited whilst I dived into the house . The credit card was fortunately where I thought it should be (a miracle) and I soon ran out of the house (remembering to lock it! ), dived back into the taxi and we headed back down the hill. We might just make it. The traffic near the station however had other ideas and the line of traffic at the lights was too much. Throwing a tenner at the driver I jumped out and ran lugging my laden panniers the last couple of hundred yards to the station. Grabbing my bike I had no time to actually collect my ticket but instead ran straight to the platform. I made the train. Just! I explained my situation to the guard who kindly let me continue and confirmed that I should be able to pick up my tickets at Ashford. And so the journey was underway. I was considerably more sweaty and on edge than planned; but I was going! After that the journey was uneventful. I was indeed able to get my tickets at Ashford and continued on to St Pancras and then to Kings Cross and the train to Newcastle. Getting the bike onto the luggage carriage was easily done and though I wondered why my seat had to be at the opposite end of the train from the luggage car I was soon settled in and headed north. Somewhere between Stevenage and Peterborough the rain started, but not to worry. Finally at around 4pm the train pulled into Newcastle. The rain was chucking down in Newcastle now. This was not exactly a part of the plan but I had to be prepared for any weather so putting on my wet gear I set off out of the station, down to the riverside and over the Millennium Bridge onto the Gateshead side of the Tyne next to the Baltic Gallery. From here the ‘Prologue’ ride would be to simply follow National Cycle Network Route 14 towards the coast at South Shields. The rain kept steady throughout most of the ride (though it did slowly start to ease off) and I took things nice and steady. This would be a total of 15 miles riding, a distance that I might normally look to knock off at quite a pace; however today was just about taking it easy. So avoiding breaking into a sweat I followed the (mostly) riverside path eastwards. The route here is quite a mix of river path riding interspersed with some inland sections where (mostly closed down) industry sits on the water front. One such section took me into Hebburn around the old Hawthorn Leslie ship works and the rather magnificent Presbyterian church built by Leslie for the ship workers. From here on the route was less scenic, passing the ‘Bede Industrial Estate’ (I’m sure that he would have appreciated it) before heading into South Shields where the route finally re-joins the river next to the South Shields Ferry. I found my way to the Roman fort (Arbeia) which was to be my starting point in the morning for the Hadrian’s Cycleway part of my grand adventure. From there it was a matter of metres to my B&B for the night. The owner was not yet in when I arrived (I was a little earlier than I had said that I would be there) so I rode a little further to take a look over the mouth of the Tyne from the a park overlooking the coast and on my return the owner was in and showed me to my room. The Britannia Guesthouse is a fairly traditional bed and breakfast but I appeared to have it to myself. I showered and sorted my gear out, filling the radiators with my wet clothes, and then headed into the town for a drink and some food. It was quite odd to see South Shields on a wet weekday evening. I have been here on a few occasions before and it was always, to say the least, a little more busy than today. South Shields is at the end of the Great North Run course, an event which I have completed four times (indeed developing ankle problems training for the last time I ran it in 2013 was what had driven me back onto the bike as my primary form of exercise). I was now walking down a deserted street that I had only ever seen packed full of runners and supporters heading from the finish line to the Metro station back into the city. It felt like a very different town this evening. I popped into Morrison’s to gather some food supplies for the next day’s ride and then settled into a comfortable chair in the Kirkpatrick pub for a couple of excellent pints (and at only £1.95 a pint – welcome to the North). That was followed by a good curry in the ‘Asha’ before heading back to the guesthouse and to bed in preparation of a long day to come.